Oracle released VirtualBox 5.1 last week, and today I downloaded the latest bits and updated my VB installation on my MBP. Right now the MBP is running with OS X Version 10.11.5 (I’ve resisted the urge to install the Sierra beta). I also updated the extensions package as well as the guest additions ISO. Once VB 5.1 installed, I updated all my existing VM’s guest additions without incident. 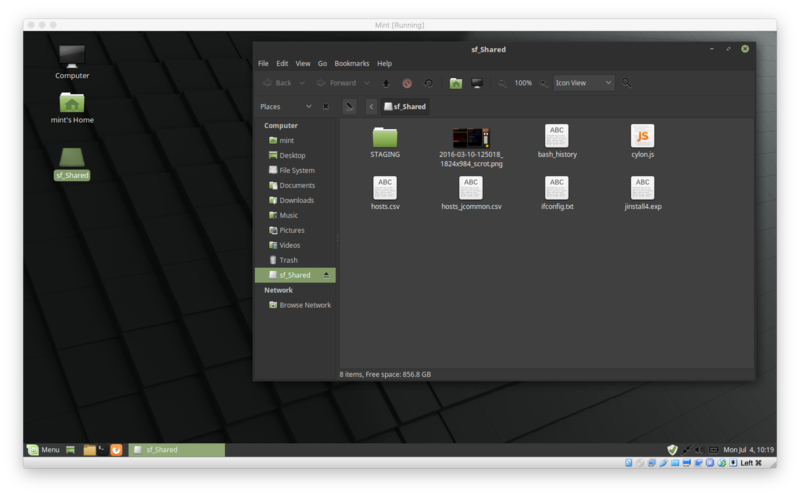 So far I have Mint 18 (seen above), Fedora 24, CentOS 6, Ubuntu 16.04, and Kali. Kali doesn’t have the guest additions as I want as pristine an environment as possible with those tools. But this version of VB isn’t without problems. I can’t seen to install the guest additions in CentOS 7 (based on RHEL 7). I don’t know why but the tools can’t find the kernel headers, even though I installed the full gcc and kernel-devel packages. I suppose I could have dug around and found out why it can’t find the kernel headers, but I have four other working Linux distributions with additions, and I just didn’t feel like putting in the effort. Lazy, I guess. I tried to install PC-BSD. Initial live media boot and installation went swimmingly. 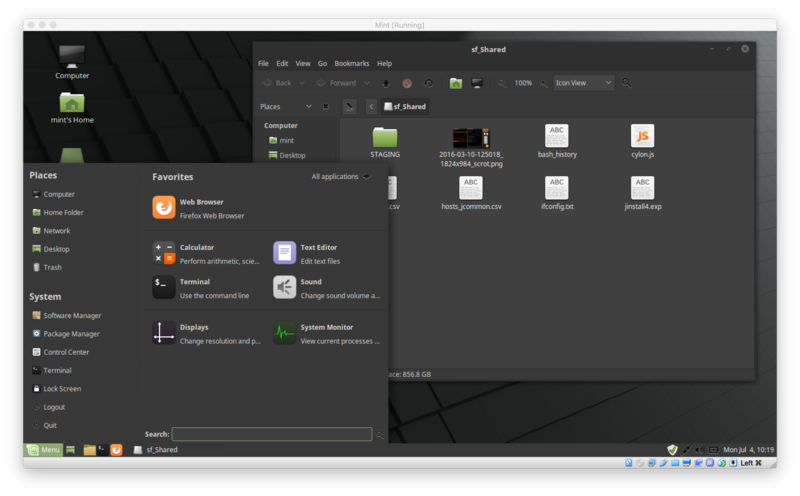 Trying to run after the install (with the MATE, the KDE, desktops) resulted in a panic. After two attempts I gave up. If I need a BSD-like OS I have Mac OS X. And if I want Unix-like, well, I have all these systems around the house, including Arch running on three Raspberry Pi 3s. I have no shortage of OS playgrounds. I decided to try out Microsoft’s Visual Studio Code editor in the Mint VM. I’ve played with it a bit on Windows 10, Ubuntu 16, and my MBP, all directly on hardware and all without incident. But trying to install and run it on my Mint 18 VM didn’t work out so well. I would have loved to have worked with the editor in the Mint 18 VM, but it looks like it’s not to be. 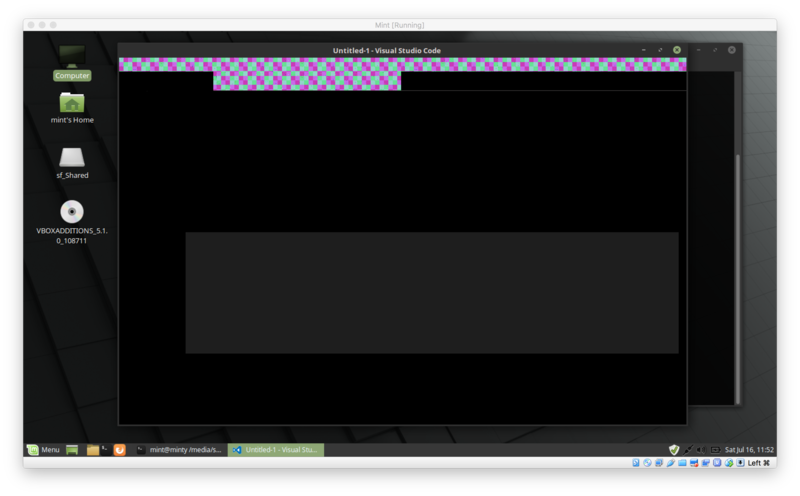 I don’t know why the editor has a corrupted interface, but it’s totally unusable in this particular setting. I still have vi and gedit as a consolation. One of the big claims with VM 5.1 is performance improvements. I use it now on my Windows 10 notebook in place of VMware, and on my MBP, and I’ve never thought it was slow. VMs seem to boot rather quickly, and the VMs operate efficiently once up and running. I’m quite happy with the way everything works. After what I wrote about abandoning Oracle’s Java, and why, you might think my use of VB is a bit hypocritical, and you’d be right; it is. Unfortunately, I’ve found nothing that works as well, especially VMware. And I need a virtualization tool that works on my multiple notebooks, with as many different Linux distributions, as possible. VMware keeps getting worse and worse in that regard. I certainly don’t mind paying for a good software package, and I almost broke down and bought a commercial copy of VMware, but the free player has been so plagued with issues that it’s turned me off buying a license (or licenses, one for Mac and one for Windows). I’ve better things to do with my time than trying to get everything initially working. I would have liked for PC-BSD to have worked (finally). But it didn’t and I refuse to go forum diving for old and/or cryptic information. Considering the definition of insanity, some might consider my continued attempts at getting FreeBSD/PC-BSD up and running in a VM (which I will do before committing hardware). Fortunately, I wasted no more than about 15 minutes before calling off the latest PC-BSD installation experiment. 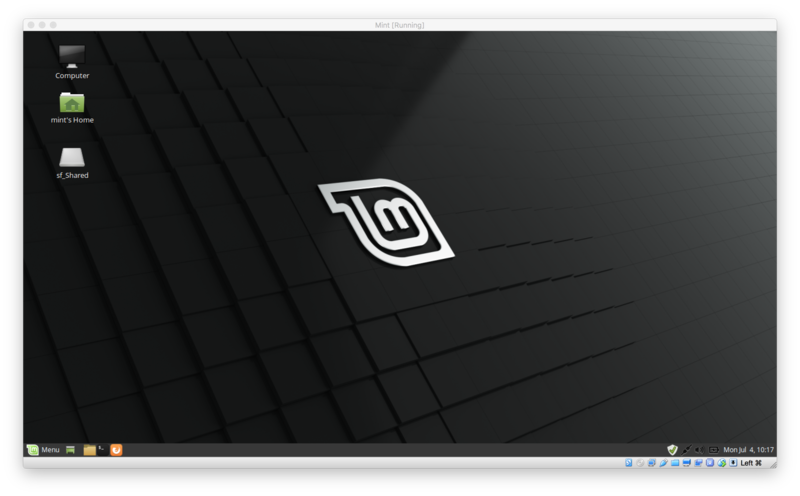 I’ve installed a VM of Linux Mint 18 on my MBP using VirtualBox 5.0.24 on Mac OS X 10.11.5. No muss, no fuss. It just installed. I did it primarily just to see what would happen. Some points of interest about the setup. 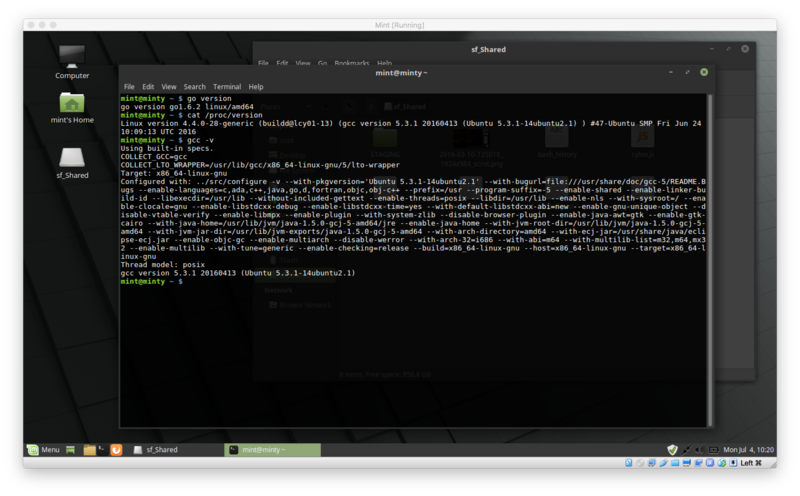 Linux Mint 18 came with the VirtualBox Guest Additions pre-installed. That shared folder showed up after installation and first boot. I added the local login to the vboxsf group in order to see the contents of the folder. 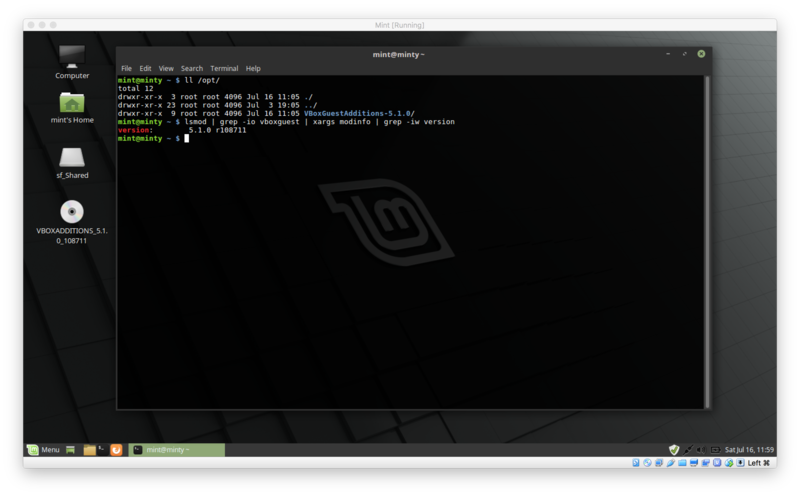 Linux Mint runs quite well. It should, being based on Ubuntu 16.04 LTS. 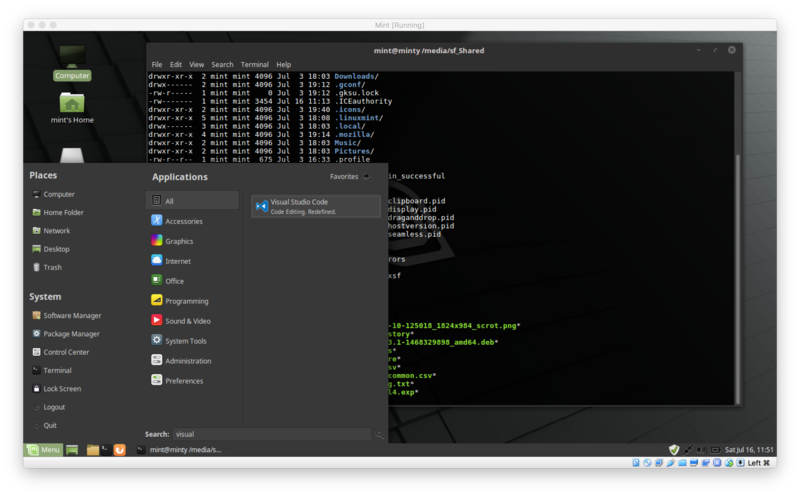 VirtualBox 5.0.24 is an excellent VM for various contemporary Linux distributions. I don’t run any other operating systems with it, so I can’t speak to them. I like the dark theme of this version quite a bit. I’m also avoiding installing Java on this VM, choosing instead to install Google’s Go Language. My other language of choice on this VM is C++. I’m going back through my other VMs and removing Java and Java tools (particularly IDEs). I’ve got VIM and gedit for the work I need. And other tools to make sure my code is as robust as possible.